It's Time . . . .
We're fortunate here north of the 49th - Not the same on the south side, tho . . . .
Oh, Come On . . . . The name Mullet and bad haircuts? Someone couldn't have seen this coming?!? 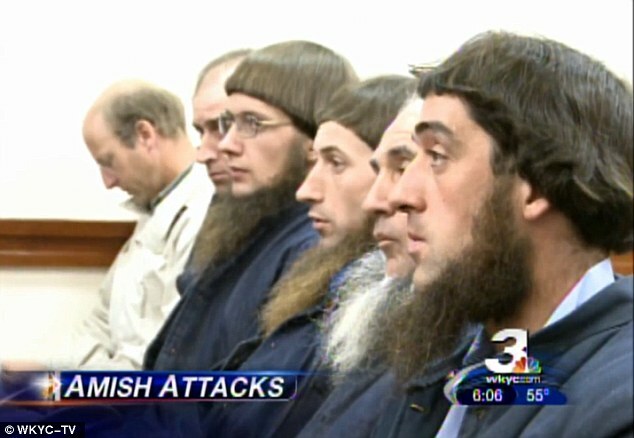 The leader of a breakaway Amish group allowed the beatings of those who disobeyed him, made some members sleep in a chicken coop and had sexual relations with married women to “cleanse them,” federal authorities said Wednesday as they charged him and six others with hate crimes in haircutting attacks against other Amish. Authorities raided the group’s compound in eastern Ohio earlier in the day and arrested seven men, including group leader Sam Mullet and three of his sons. Johnny Mullet told detectives that it was his idea to cut the hair and beards and that he discussed the idea with his father, who gave him the addresses of two victims, the affidavit said. Lester Mullet told detectives that after two attacks in late September, the men went home and told Sam Mullet what happened. He said his father laughed and called them nuts, the court document said. Like I said: "Oh, come on . . . ."
1% Smackdown . . . . They don't look happy, do they? Maybe 'cuz of this bit of news from SocialistWorker.org today? OCCUPY CHICAGO won a victory on November 14 when the University of Chicago was forced to cancel a scheduled lecture from former Secretary of State Condoleezza Rice and ex-Treasury Secretary Henry Paulson. The University of Chicago announced on its website that Rice and Paulson's presentations had been canceled "due to an unforeseen scheduling conflict"--but many wondered if the "conflict" actually lay in the university's plans to hold the event, and Occupy Chicago's plans to shut it down. 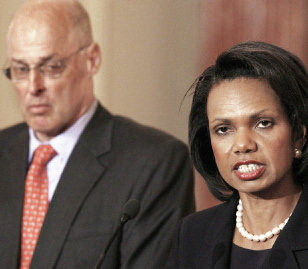 The truth is this: When threatened with a disruption organized by a movement that rejects the entirety of what they stand for, Paulson and Rice simply threw in the towel. The effective derailing of the lecture represents a victory for Occupy Chicago, which has had to struggle for its right to exist. Over the past month, Chicago Mayor Rahm Emanuel has overseen two mass arrests conducted against Occupy activists involving more than 300 people. Emanuel's administration has also unambiguously denied the movement's right to a permanent space to occupy. In May 2012, the NATO/Group of 8 summit is scheduled to come to the Windy City. Shutting down that event won't be so easy, but with this victory under their belt, we can be sure that the voices of Occupy Chicago will echo around the world. Anyone up for a trip to Chicago next May ? ? ? ? Robert Scheer Remembers bill clinton . . . . Still wanna buy the book ? ? ? ? Occupy Denver Elects a Leader . . . .
and our Four-Footed-Child heartily agrees with the choice . . . .
Boris: Who's the speaker at the 8:12 mark ? ? ? ? 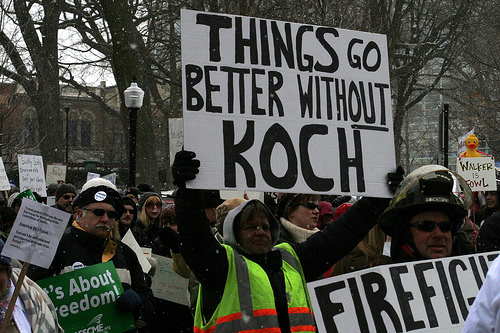 Have a koch and a $mile ? ? ? ? The right-wing-billionaire-zealot brother$ koch are about to fully engage their database war on the rest of the civilized world. The secretive oil billionaires the Koch brothers are close to launching a nationwide database connecting millions of Americans who share their anti-government and libertarian views, a move that will further enhance the tycoons' political influence and that could prove significant in next year's presidential election. The database will bring together information from a plethora of right-wing groups, tea party organisations and conservative-leaning thinktanks. Each one has valuable data on their membership – including personal email addresses and phone numbers, as well as more general information useful to political campaign strategists such as occupation, income bracket and so on. At their most recent billionaires' gathering in Vail, Colorado in June, Charles Koch described next year's presidential contest as "the mother of all wars". A tape of his private speech obtained by Mother Jones said the fight for the White House would be a battle "for the life or death of this country". Exhorting the 300 guests in attendance to open their sizeable wallets and donate to the Koch election coffers, he went on: "It isn't just your money we need. We need you bringing in new partners, new people. We can't do it alone. We have to multiply ourselves." "We have to multiply ourselves." Not unlike rats in a garbage dump . . . .
"The Party of the People . . . ."
Is not that "people friendly" according to this piece from SocialistWorker.org. More generally, the truth is this: Democratic mayors may talk about how they sympathize with the Occupy movement. They may even try to speak in its name, as Quan has. But their office requires them to keep order and protect the interests of the 1 percent--and so they will turn to repression to try to stop the struggle from disrupting business as usual. THE SAME truth applies further up the chain, in the White House of Barack Obama, the first African American president of the U.S.
Where was Barack Obama, who claimed to understand the "broad-based frustration" of the movement, when Occupy activists in Oakland were reclaiming Oscar Grant Plaza after enduring vicious police violence 24 hours earlier? Answer: He was across the Bay at a $5,000-a-plate fundraiser for his presidential campaign. Quelle surprise, eh ? ? ? ? 99% Action from Home . . . .